Texel, 28 June 2014 - The first finisher of the 37th edition of Round Texel was the team of Peter Vink and Mischa de Munck in a Nacra 20 catamaran with custom daggers and rudders, which makes the boat 'fly'. The participants and the organization were treated to plenty of sun and a south-westerly wind decreasing from 12-8 knots. Nearly 300 boats took part with around 600 sailors and 18,000 spectators around the course. Vink and De Munck crossed the finish line at Paal 17 after about 2½ hours, with Xander Pols and Stefan Dubbeldam hot on their heels right up to the finish. Vink and De Munck were about 20 minutes too slow to beat the 2009 record. But the duo is not the winner of the 37th edition of the Round Texel. Their boat’s handicap is not to their advantage. The results will only be given once all the smaller and slower participants have finished. The participants and the organization were rewarded with superb sailing conditions. The south-westerly wind was looking to favour a fast race, but as the wind decreased, so did any chance of a record. The winner and sail-maker Peter Vink said afterwards: "This is the best you can have for all participants. Everyone makes it around. Perfect. I never really thought about the record during the race. We sailed smart and conservative. We still really need to learn how to sail with these hydrofoil techniques. Maybe next year, if we have such great weather again." "I found it very exciting, especially since we’re here with a new production boat. No one had seen it yet." As sail maker and boat builder, Vink is closely involved in the design and production of the Nacra boats. "This was the introduction of our new Nacra 20 production boat. We had a good start, sailed well and crossed the line first, that's amazing. The record never really crossed my mind. I wanted to sail all the way around and sail around well. This is just the best race, each and every time. Sail hard and then enjoy being here on the beach." Several teams have converted their catamaran into a boat that, with little wind, comes up out of the water and ‘flies’ on its daggers and rudders. This hydrofoil technology, as it is known, has been used in commercial shipping for many years, mainly by ferries. But since the advent of better materials (i.e. carbon fibre) and its abilities, it can now be applied to recreational boating. The best example of this technique could be seen during the America's Cup races in 2013. 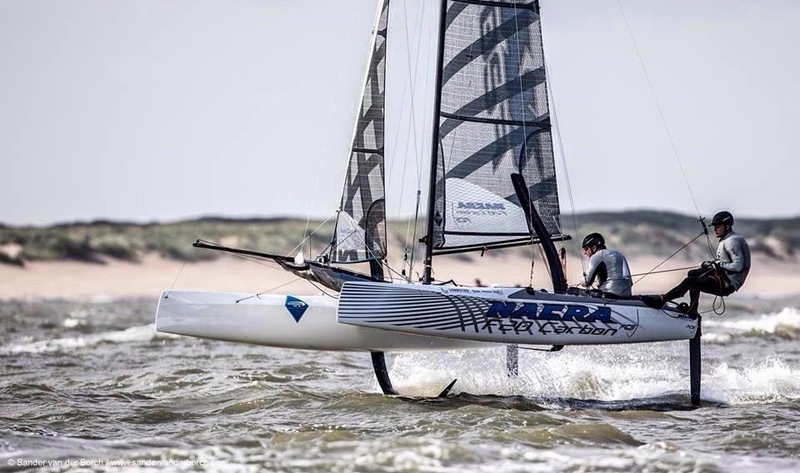 Vink had renowned agency Morelli Melvin design his S-shaped daggers for the Nacra 20 Carbon. The daggers are now in production and one can simply order them with their new boat. In short, the America's Cup technique has been used successfully during the Round Texel. The Round Texel is sailed in accordance with the so-called Texel Rating handicap system. That is a value used to calculate your adjusted time. Vink and De Munck sailed with a rating of 87, while the winner is expected to come from the smaller Formula 18 cats or the Olympic Nacra 17 class.